PlantBot Genetics is a collaborative pair of artists, Wendy DesChene + Jeff Schmuki, whose work combines activism, research and social space to foster discussion and generate action in the area of ecological awareness. The artists presented their recent work, The Moth Project, as an exhibition in the Centennial Hall Galleries, alongside examples of local moths from the Augustana Entomology Collection. A week-long residency capped off the exhibition, in which the artists worked with Augustana students to create art-based educational interventions around the Quad Cities. PlantBot Genetics is a parody biotech corporation that satirically looks at the possible evolution of plant species due to the consequences of modern agricultural practices. PlantBot Genetics Inc presents an engaging overview of second shift pollinators such as the moth, along with recent advances in self-pollinating robo-plants. The Moth Project highlights inspired responses to the decline of the honeybee and the hope that Moths and PlantBots will step in and save the day. Longfellow kindergarteners and and 6th graders' moth drawings. 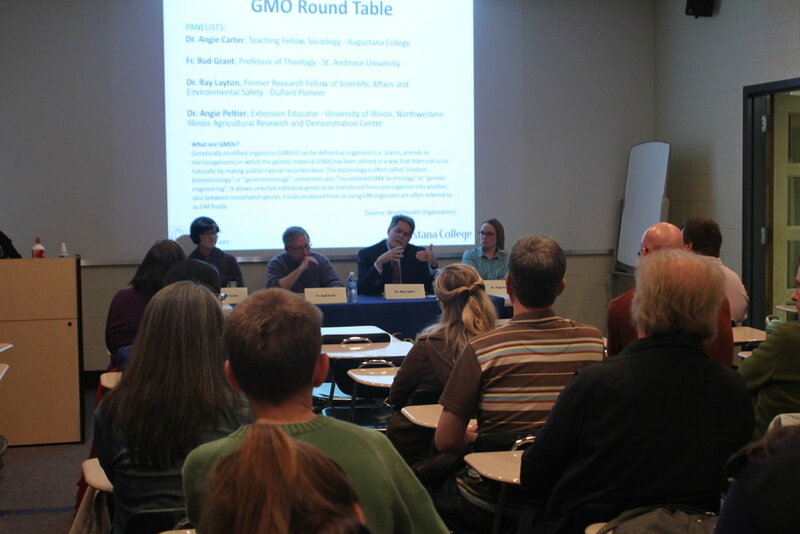 Panelists gave short presentations on GMOs from their perspective, followed by a moderated dialogue between panelists + audience members on the issues surrounding GMOs. 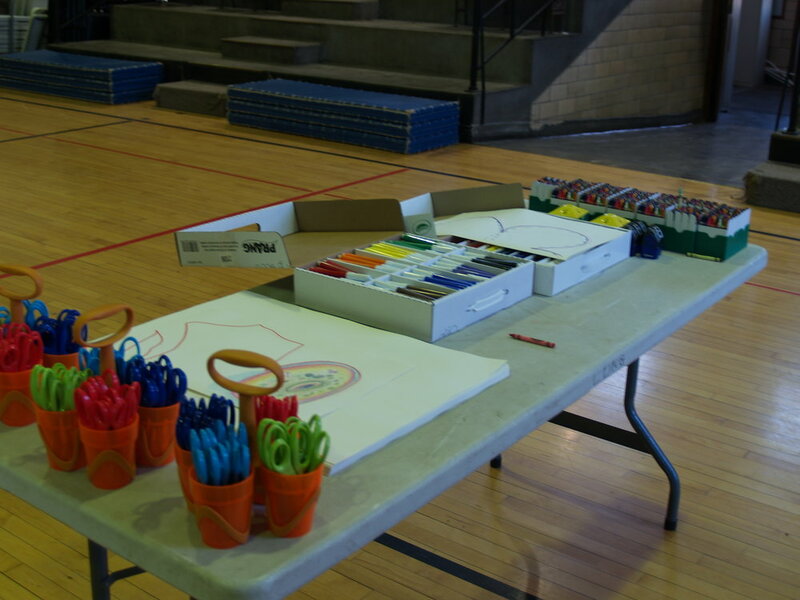 While during their residency, DesChene and Schmuki worked with Augustana Education students to teach Longfellow Elementary kindergartners and sixth graders about moths and local pollinators, helped them explore the mobile artLab, and draw moths for a mural in the Longfellow gymnasium. Later in the week, the Longfellow students visited the exhibition in the Centennial Hall Galleries. DesChene + Schmuki worked with Augustana students to create student-made PlantBots for the events at the Figge and Freight House Farmer’s Market. These fictitious plantbots functioned as touchstones for conversation about the real pollinators and ecosystems in the Quad Cities. The artists brought their mobile lab and the Augustana student-made PlantBots in a workshop as a means to educate community members about local pollinators at two events: the Figge and Farmer’s Market. The Augustana Teaching Museum of Art organized a Green Block Party at the Figge Art Museum, which featured the student-made PlantBots, the mobile ArtLab, and it provided a space community partners (Iowa Learning Farms, Quad Cities Food Hub, Radish Magazine, U.S. Fish & Wildlife, Nahant Marsh, People for Pollinators, Living Lands and Waters, Trees Forever, Pheasants Forever, River Bend Wildland Trust, the Sierra Club) to share how their organizations provide support for local pollinators. Also that evening, the artists also gave a lecture about their work. At the Freight House Farmer’s Market, the artists and Augustana students taught community members about the importance of local pollinators through the student-made PlantBots and the mobile ArtLab. Marketing materials. Taking a cue from the artists' work, we designed a removable sticker and stencil (to be used with chalk spray paint) to advertise for the exhibition + residency through our hashtag.